which could point to any node in the list or null. 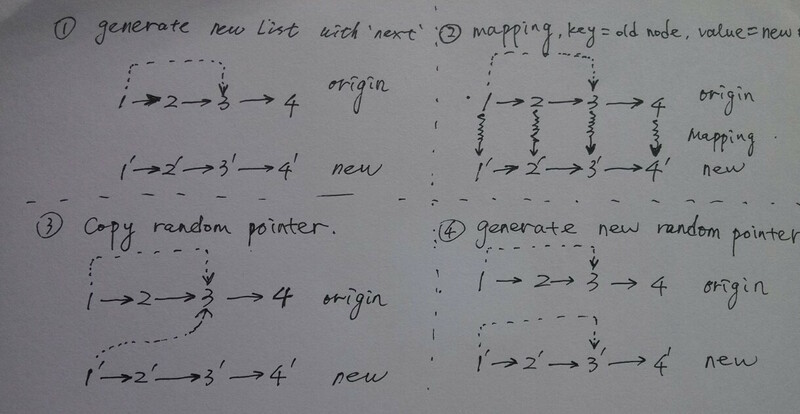 # Definition for singly-linked list with a random pointer. * @param head: The head of linked list with a random pointer. * @return: A new head of a deep copy of the list. 总共要进行两次扫描，所以时间复杂度是 O(2n)=O(n)O(2n)=O(n)O(2n)=O(n), 在链表较长时可能会 TLE(比如 Python). 空间上需要一个哈希表来做结点的映射，所以空间复杂度也是 O(n)O(n)O(n). 遍历一次原链表，判断哈希表中 key 是否存在，故时间复杂度为 O(n)O(n)O(n), 空间复杂度为 O(n)O(n)O(n).